In this protocol, derivation of cardiac progenitor cells from both mouse and human embryonic stem cells will be illustrated. A major strategy in this protocol is to enrich cardiac progenitor cells with flow cytometry using fluorescent reporters engineered into the embryonic stem cell lines. Lei, I. L., Bu, L., Wang, Z. Derivation of Cardiac Progenitor Cells from Embryonic Stem Cells. J. Vis. Exp. (95), e52047, doi:10.3791/52047 (2015). Cardiac progenitor cells (CPCs) have the capacity to differentiate into cardiomyocytes, smooth muscle cells (SMC), and endothelial cells and hold great promise in cell therapy against heart disease. Among various methods to isolate CPCs, differentiation of embryonic stem cell (ESC) into CPCs attracts great attention in the field since ESCs can provide unlimited cell source. As a result, numerous strategies have been developed to derive CPCs from ESCs. In this protocol, differentiation and purification of embryonic CPCs from both mouse and human ESCs is described. Due to the difficulty of using cell surface markers to isolate embryonic CPCs, ESCs are engineered with fluorescent reporters activated by CPC-specific cre recombinase expression. Thus, CPCs can be enriched by fluorescence-activated cell sorting (FACS). This protocol illustrates procedures to form embryoid bodies (EBs) from ESCs for CPC specification and enrichment. The isolated CPCs can be subsequently cultured for cardiac lineage differentiation and other biological assays. This protocol is optimized for robust and efficient derivation of CPCs from both mouse and human ESCs. Heart disease remains the leading cause in the world today and the death rates have remained virtually unchanged in the past two decades (American Heart Association). There is a critical need for developing novel therapeutic strategies to effectively prevent or reverse heart failure. One promising strategy is cell-based therapy following the rapid development of stem cell biology1. In this regard, multipotent CPCs could be an excellent cell source for the therapy due to their ability to proliferate but committed only to cardiac lineage differentiation. Therefore, efficient and robust method to generate and isolate CPCs is of great importance for heart cell therapy studies. This protocol focuses on embryonic CPCs identified during early embryogenesis and how their generation from ESCs. Various CPCs have been isolated from embryonic and adult hearts, even from bone marrows2. During embryo development, bone morphogenetic proteins (BMPs), wingless-type MMTV integration site family members (Wnts) and Nodal signals induce the commitment of the Mesp1+ multipotent mesoderm3. Mesp1+ cells then differentiate into the embryonic CPCs4. These CPCs are typically marked by HCN4, NK2 homeobox 5 (Nkx2-5), Isl LIM homeobox 1 (Isl1), T-box 5 (Tbx5), and myocyte enhancer factor 2C (Mef2c), form primary and second heart fields, and contribute to the major parts of heart during cardiogenesis5-10. Both Nkx2-5+ and Isl1+/Mef2c+ CPCs are able to differentiate into cardiomyocytes, smooth muscle cells (SMCs), and endothelial cells5-8. Thus these CPCs will give rise to cardiac vasculature as well as cardiac tissues and are an ideal cell source for cell-based heart therapy. Consequently, generating CPCs in vitro has been a major research focus in cardiovascular studies. Since ESCs have unlimited expansion capacity and represent the ICM cells at the blastocyst stage, differentiation of ESCs into embryonic CPCs following the natural embryogenesis is considered a logical and effective approach to obtain CPCs. One widely applied approach to obtain CPCs from ESCs is to aggregate ESCs into EBs11. To improve the differentiation efficiency, defined chemical and growth factors based on the knowledge of cardiac development have been used12-14. However, there are no definitive CPC markers, particularly no cell-surface markers, which are widely accepted in the field. To address this issue, ESCs are engineered to mark Isl1+ or Mef2c+ CPCs and their derivatives with fluorescent reporters using Cre/loxP system. The cre recombinase is knocked in under the control of Isl1/Mef2c promoter/enhancer. Modified fluorescent protein RFP or YFP gene driven by a constitutive promoter can be activated by excision of flox stop codon with cre recombinase (ISL1:cre;pCAG-flox-STOP-flox-GFP or RFP/Isl1-cre;Rosa26YFP/Mef2c-cre;Rosa26YFP)5,6. Once the ESCs are differentiated into second heart field CPCs, Isl1/Mef2c promoter/enhancer driven cre will activate the fluorescent reporters and CPCs can be enriched by FACS-purification. Briefly, EB aggregation method is used to initiate ESC differentiation. To enhance differentiation efficiency, the differentiated cells are treated with ascorbic acid (AA) and growth factors such as Bmp4, Activin A and Vegf13,15. This protocol allows robust and efficient CPC differentiation using both mouse and human ESCs. Prepare mouse embryonic fibroblasts (MEFs) feeder layer. Warm MEF medium (10% FBS in DMEM) to 37 °C. Add 1 ml of 0.1% Gelatin in water into a well of 6-well plate or 5 ml into a 10 cm dish. Leave plates or dishes at 37 °C or room temperature for at least 30 min. Aspire the gelatin prior to use. Thaw irradiated MEFs quickly in a 37 °C water bath, with gentle shaking. Transfer the cells gently to a 15 ml or 50 ml conical tube. Add 5 ml of pre-warmed MEF medium. Swirl the cells slowly and centrifuge at 200 x g for 5 min. Resuspend cells in MEF medium and count viable cells. Use the following volumes of MEF medium: 2 ml for cells per well from a 6-well plate and 10 ml for cells from a 10 cm dish. Plate cells into 6-well plates or 10 cm dishes at 1-2 x 106 per plate/dish. Incubate the MEF plates/dishes at 37 °C, 5% CO2 at least 24 hr prior to use. NOTE: Discard MEF plates/dishes older than a week. Culture the Isl1-cre; Rosa26YFP/ Mef2c-cre; Rosa26YFP mouse ESCs on MEFs till 90% confluent. Use ES cell medium comprised of 410 ml DMEM, 75 ml FBS, 0.1 mM MEM NEAA, 2 mM L-glutamine, 0.1 mM Pyruvate, 100 U Pen/Strep, and 0.1 mM β-mercaptoethanol. Prepare gelatin coated 6-well plates as described in 1.1.2. Aspirate medium from plates and rinse cells with DPBS. Aspirate DPBS and add 0.4 ml 0.25% Trypsin into one well of 6-well plate. Incubate cells at 37 °C, 5% CO2 for 5 min. Add 1 ml pre-warmed ES medium to cease Trypsin reaction. Harvest cells and centrifuge cells at 200 x g and aspirate medium. Resuspend cells in 1 ml ES cell medium and count the cells. Plate ESCs on gelatin-coated plates at density of 3 x 104/cm2. Incubate at 37 °C, 5% CO2 for about 2 days when ESCs reach about 90% confluent. Change the medium everyday. When ESCs are 90% confluent, repeat Steps 1.2.2-1.2.5 to completely remove the MEF feeders. Prepare differentiation medium as followed: 36 ml IMDM, 12 ml Ham’s F12, 2 mM L-glutamine, 0.34 ml BSA (7.5%), 0.25 ml N2, 0.5 ml B27, 50 µg/ml AA, and 0.45 mM 1-thioglycerol. Aspirate medium from cells and rinse with DPBS. Aspirate DPBS and add 0.4 ml 0.25% Trypsin into one well of 6-well plate. Incubate at 37 °C for 5 min. Add 1 ml differentiation medium to cease the reaction and pipette up and down to disperse cell clusters into single cells. Centrifuge ESCs at 200 x g for 5 min and discard the medium. Resuspend 1 x 106 ESCs in 1 ml differentiation medium. Count the cells, and culture the cells in low detachment Petri dish at concentration of 1 x 105 cells/ml in differentiation medium at 37 °C for first EB aggregation. Two days after EB formation, transfer EBs from dishes to 50 ml tubes. Spin at 200 x g for 1 min. Remove medium and rinse EBs with 10 ml DPBS without Ca2+ and Mg2+. Aspirate DPBS and add 1 ml 0.25% Trypsin. Incubate at 37 °C for 5 min. Add 4.5 ml differentiation medium to stop the reaction. Pipet up and down to dissociate EBs into single cells. Centrifuge the cells at 200 x g for 5 min. Aspirate medium and resuspend cells in 1 ml differentiation medium. Count the cells, and dilute 2 x 106 cells to 1 x 105 cells/ml in differentiation medium. Add VEGF, Bmp4 and Activin A to the medium at final concentration of 5 ng/ml, 0.8 ng/ml, and 5 ng/ml, respectively. Culture the cells in Petri dish for second EB formation at 37 °C. 40 hr after second EB formation, transfer EBs to 50 ml tubes. Rinse with DPBS once, dissociate EBs with 1 ml 0.25% Trypsin at 37 °C for 5 min. Pipet up and down to dissociate EBs into single cells. Resuspend the cells in Stempro-34 medium with 5 ng/ml VEGF, 10 ng/ml bFGF and 12.5 ng/ml FGF10. Plate the cells at 2 x 105/cm2 in gelatin-coated plates. Culture in 37 °C incubator for about 32 hr before CPC isolation. Aspirate medium and rinse with DPBS. Add 0.5 ml 0.25% Trypsin to culture plates at 37 °C for 5 min. Add 4.5 ml differentiation medium to stop the reaction. Pipet up and down to dissociate EBs into single cells. Collect the cells by centrifuge and resuspend cells in 2% FBS/PBS for FACS-purification. Run undifferentiated ESCs on sorter as the negative control. Change voltage to adjust forward scatter (FSC) and side scatter (SSC) to select desired population. Use forward scatter versus side scatter and forward scatter height versus width to exclude debris and doublet. In the selected sub-population, according to the distribution of ESC controls, draw a gate of YFP positive on histogram to eliminate cell autofluorescence. Collect YFP+ CPCs from YFP+ gating. Plate the purified CPCs (YFP+ cells) in 6-well plates with differentiation medium (1.3.1). Culture additional 3-5 days at 37 °C for differentiation of CPCs into cardiomyocytes and SMCs. Prepare mouse embryonic fibroblasts (MEFs) feeder layer as described above at a density of 2 x 104/cm2. Maintain human ISL1:cre;pCAG-flox-STOP-flox-GFP or RFP ESCs routinely on MEF using regular hESC medium (Knockout DMEM/F-12 385 ml, Knockout SR 100 ml, 2 mM L-glutamine, 0.1 mM NEAA, 0.1 mM β-mercaptoethanol, 10 ng/ml basic FGF). Prior to cardiac differentiation, transfer human ESCs in feeder free condition for at least 2 passages. Prepare coated plates for human ESCs culture. Thaw matrigel at 4 °C overnight. Put a 50 ml tube on ice and add 30 ml cold DMEM/F12 medium into the tube. Add 1 ml matrigel into the cold medium and mix well. Add 1 ml cold matrigel-DMEM/12 medium into a well of 6-well plate or 5 ml into a 10 cm dish. Leave plates/dishes at 4 °C overnight or room temperature for 2 hr. Aspirate medium prior to use. Split human ESCs onto the plates: Aspirate media from MEF plate and rinse human ESCs with DPBS. Then add 1 ml dispase (1 mg/ml) to a well of 6-well plate. Incubate cells in 37 °C incubator until edges of colonies start to detach. Remove dispase solution. Rinse with DPBS twice, then add 2.5 ml/per well mTeSR medium or MEF-conditioned medium to the plate. Scrape cells using a cell scraper and carefully pipet up and down to break human ESC colonies into small clumps. Transfer the ESC clumps and dilute 1:3 into the coated plates. Add 2 ml/well mTeSR medium or MEF-conditioned medium and change medium daily. Culture human ESCs in mTeSR medium or MEF-conditioned medium on coated plates for at least 2 passages. When cells are ~90% confluent, aspirate the medium and rinse with DPBS. Then incubate the hESCs in 0.5 mg/ml Dispase at 37 °C for 20 min. Rinse the hESCs with DPBS twice, remove cells from plates with a cell lifter, then resuspend cell clamps in differentiation medium (DMEM/F12 containing 18% FBS, 0.1 mM NEAA, 2 mM L-glutamine, 0.1 mM β-mercaptoethanol and 50 µg/ml Ascorbic Acid). Transfer cells into 6-well ultra-low attachment plates for EB formation. Change differentiation medium next day. Replace medium every 3 days and maintain EBs in suspension culture. Collect EBs no later than day 9 of differentiation for human CPC isolation. Aspirate medium and rinse EBs with DPBS twice. Add 0.5 ml 0.25% Trypsin to each well of 6-well culture plates at 37 °C for 5 min. Add equal volume of differentiation medium to stop the reaction. Pipet up and down to dissociate EBs into single cells. Collect the cells by centrifuge at 200 x g for 5 min and resuspend cells in 2% FBS/DPBS. Filter cells with 40 µm cell strainer and FACS-purified the RFP+ CPC cells as described in 1.4.3. Plate sorted hCPCs onto geltin-coated plates. Culture hCPCs in differentiation medium for 7-9 days to differentiate into cardiomyocyte and smooth muscle cells. 7 days after plating, culture differentiated cells with 5% Knockout SR in DMEM/F12 medium. The protocol shows derivation of CPCs from several ES cell lines. ESCs are aggregated to form EBs to differentiate into CPCs. ESCs are routinely maintained on MEF feeders (Figure 1A, F) and feeders are removed before differentiation. Upon aggregation of ESCs into EBs in differentiation medium (Figure 1B, G), the second formed EBs are treated with Bmp4 and Activin A to enhance the mesoderm differentiation in mouse cell lines (Figure 1C). ESCs are differentiated into cardiac lineage as identified by florescent protein YFP/RFP (Figure 1D). CPCs were FACS-purified (Figure 1H) and further cultured to differentiate into cardiomyocytes and smooth muscle cells. The staining of cTnT and SM-MHC showed the differentiation capacity of CPCs into cardiomyocytes and smooth muscle cells (Figure1 E,I,J). Typically, 80-90% CPCs are obtained from the mouse ESC differentiation protocol and 0.5-5% CPCs are obtained from the human ESC differentiation protocol. Figure 1: Differentiation of ESCs into multipotent CPCs. (A-E) mouse ESC differentiation. (A) Morphology of mouse ESC in feeder cells. (B) First EB formation of mouse ESCs. (C) Second EB formation in differentiation medium with growth factors. (D) CPCs are expressing YFP. (E) Cardiomyocytes (cTnT+) derived from FACS-purified CPCs. (F-J) Differentiation of human ESCs. (F) Morphology of human ESC maintained on feeder cells. (G) EB formation of human ES cells. (H) FACS-purified of CPCs. (I-J) CPCs differentiated into cardiomyocytes (cTnT+) and smooth muscle cells (SM-MHC+). Scale bar: A-C,F,G, 100 μm. D,E,I,J, 5 μm. Please click here to view a larger version of this figure. This protocol combines a method using growth factors to guide mESCs differentiation and spontaneous differentiation of human ESCs into CPCs. CPC lineage marked with fluorescent reporter is used to efficiently identify and isolate CPCs by FACS. The FACS-purified CPCs retain the capacity to differentiate into cardiomyocytes, smooth muscle, and endothelial cells and have a comparable expression profile to the in vivo cells. Thus, these CPCs can serve as a great resource for cell based heart therapy because of their ability to form both cardiac muscle and vessel structures. One critical step in this protocol is to identify the correct timing associated with high purity and quantity of CPCs during in vitro differentiation. There are many conditions (e.g., serum lot number, cell line, etc.) that might affect differentiation of pluripotent stem cells into CPCs. Pilot experiments for optimization of differentiation and determination of the right time window for isolation of CPCs are strongly recommended. The purification of CPCs in this protocol depends on the fluorescent reporter which is activated by tissue specific cre recombinase. The reporter specificity relies on the fidelity of the promoter of cardiovascular progenitor markers and cre recombinase. The recent development of genome editing tools such as CRISPR/Cas9 system allows efficient generation of a fluorescent reporter in ESCs16-21. Therefore, these technologies may be used to engineer more stringent and better CPC-reporter cell lines in future. Subsequently, the use of FACS-purification of CPCs may be widely applied to these superior lines. Another important consideration is the combination of CPC reporters with growth factor treatment. In this protocol, human ESCs are not treated with growth factors to enhance the differentiation efficiency. Many approaches have been described for directed and efficient cardiomyocyte differentiation of human ESCs/iPSCs with growth factors. For example, highly efficient cardiomyocyte generation can be achieved by monolayer culture of hESCs/iPSCs with high levels of Activin A and BMP422, and the formation of human EBs with growth factors13,23-25. Recently, a sequential application of Glycogen synthase kinase 3 (GSK-3) inhibitor CHIR99021 and Wnt/β-catenin pathway inhibitor IWP2/4 has also been reported to drive robust cardiomyocyte differentiation of human pluripotent stem cells26. Even though these methods are focused on cardiomyocyte differentiation but not on CPCs, combining these methods with the CPCs reporter system should enable a higher percentage of CPCs differentiation. Furthermore, by combining the genetic modifications with these cardiomyocyte differentiation protocols, it will be possible to isolate and then differentiate CPCs into distinct cell lineages as desire, such as ventricular and atrial myocytes27. It is worth noting, that the efficacy of ESCs EB/monolayer based differentiation and the effects of growth factors vary considerably among different lines. Therefore, selection of optimal ESC lines for CPC differentiation should be considered carefully. We thank Dr. Leonid Gnatovskiy for his carefully and critical reading of the paper. This work was supported in part by grants from the National Institutes of Health (HL109054) and the Samuel and Jean Frankel Cardiovascular Center, University of Michigan (Inaugural Fund) to WZ and from the Leon H Charney Division of Cardiology, New York University School of Medicine to BL. Garbern, J. C., Lee, R. T. Cardiac stem cell therapy and the promise of heart regeneration. Cell Stem Cell. 12, (6), 689-698 (2013). Passier, R., van Laake, L. W., Mummery, C. L. Stem-cell-based therapy and lessons from the heart. Nature. 453, (7193), 322-329 (2008). Bondue, A., Blanpain, C. Mesp1: a key regulator of cardiovascular lineage commitment. Circulation Research. 107, (12), 1414-1427 (2010). Bondue, A., et al. Mesp1 acts as a master regulator of multipotent cardiovascular progenitor specification. Cell Stem Cell. 3, (1), 69-84 (2008). Bu, L., et al. Human ISL1 heart progenitors generate diverse multipotent cardiovascular cell lineages. Nature. 460, (7251), 113-117 (2009). Lei, I., Gao, X., Sham, M. H., Wang, Z. SWI/SNF protein component BAF250a regulates cardiac progenitor cell differentiation by modulating chromatin accessibility during second heart field development. The Journal of Biological Chemistry. 287, (29), 24255-24262 (2012). Lei, I., Liu, L., Sham, M. H., Wang, Z. SWI/SNF in cardiac progenitor cell differentiation. Journal of Cellular Biochemistry. 114, (11), 2437-2445 (2013). Wu, S. M., et al. Developmental origin of a bipotential myocardial and smooth muscle cell precursor in the mammalian heart. Cell. 127, (6), 1137-1150 (2006). Spater, D., et al. A HCN4+ cardiomyogenic progenitor derived from the first heart field and human pluripotent stem cells. Nature Cell Biology. 15, (9), 1098-1106 (2013). Verzi, M. P., McCulley, D. J., De Val, S., Dodou, E., Black, B. L. The right ventricle, outflow tract, and ventricular septum comprise a restricted expression domain within the secondary/anterior heart field. Developmental Biology. 287, (1), 134-145 (2005). Boheler, K. R., et al. Differentiation of pluripotent embryonic stem cells into cardiomyocytes. Circulation Research. 91, (3), 189-201 (2002). Wada, R., et al. Induction of human cardiomyocyte-like cells from fibroblasts by defined factors. Proceedings of the National Academy of Sciences of the United States of America. 110, (31), 12667-12672 (2013). Takahashi, T., et al. Ascorbic acid enhances differentiation of embryonic stem cells into cardiac myocytes. Circulation. 107, (14), 1912-1916 (2003). Wamstad, J. A., et al. Dynamic and coordinated epigenetic regulation of developmental transitions in the cardiac lineage. Cell. 151, (1), 206-220 (2012). Gaj, T., Gersbach, C. S. 3rd, Barbas, T. A. L. E. N. ZFN, TALEN, CRISPR/Cas-based methods for genome engineering. Trends in Biotechnology. 31, (7), 397-405 (2013). Joung, J. K., Sander, J. D. TALENs: a widely applicable technology for targeted genome editing. Nature Reviews. Molecular Cell Biology. 14, (1), 49-55 (2013). Yang, H., et al. One-step generation of mice carrying reporter and conditional alleles by CRISPR/Cas-mediated genome engineering. Cell. 154, (6), 1370-1379 (2013). Laflamme, M. A., et al. Cardiomyocytes derived from human embryonic stem cells in pro-survival factors enhance function of infarcted rat hearts. Nature. biotechnology. 25, (9), 1015-1024 (2007). Burridge, P. W., et al. A universal system for highly efficient cardiac differentiation of human induced pluripotent stem cells that eliminates interline variability. PloS One. 6, (4), e18293 (2011). Kouskoff, V., Lacaud, G., Schwantz, S., Fehling, H. J., Keller, G. Sequential development of hematopoietic and cardiac mesoderm during embryonic stem cell differentiation. Proceedings of the National Academy of Sciences of the United States of America. 102, (37), 13170-13175 (2005). Xu, X. Q., et al. 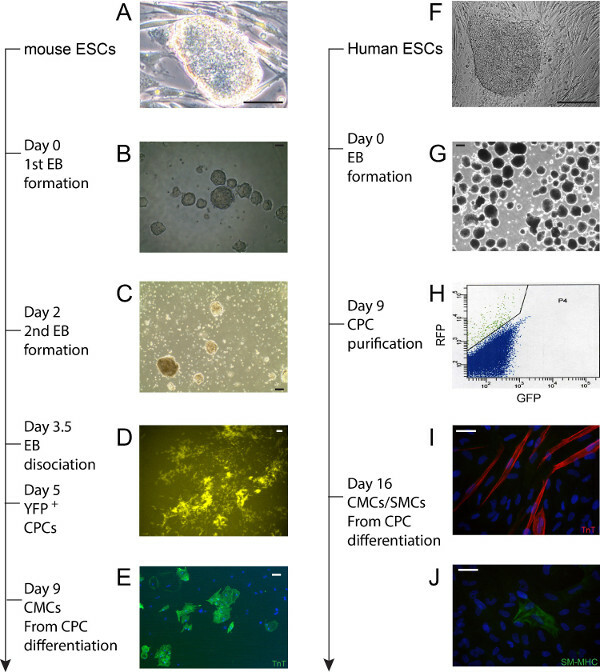 Chemically defined medium supporting cardiomyocyte differentiation of human embryonic stem cells. Differentiation: Research in Biological Diversity. 76, (9), 958-970 (2008). Lian, X., et al. Robust cardiomyocyte differentiation from human pluripotent stem cells via temporal modulation of canonical Wnt signaling. Proceedings of the National Academy of Sciences of the United States of America. 109, (27), E1848-1857 (2012). Bizy, A., et al. Myosin light chain 2-based selection of human iPSC-derived early ventricular cardiac myocytes. Stem Cell Research. 11, (3), 1335-1347 (2013). Posted by JoVE Editors on 08/10/2016. Citeable Link. A correction to the author list was made to: Derivation of Cardiac Progenitor Cells from Embryonic Stem Cells.